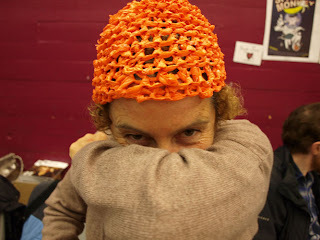 So I have just returned from a day knitting at a book festival. I can't really think of a better combination of activities, except it didn't involve any writing. I did, however, swap some clothes for a skirt, and some books for another book, so I reckon I came out on top regardless. 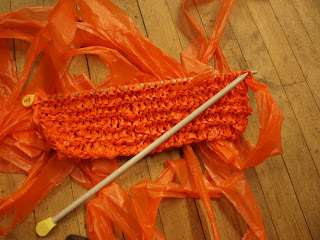 The theme of the day was knitting from recycled materials, namely plastic bags. It sort of turned into an advert for Sainsbury's as those were the predominant supply of bags, but the orange, I think, sets off Wendy's eyes quite marvellously. I was knitting a book bag, but then the day was drawing to a close and I had been a little ambitious with the size, so I turned it into a hat. Good job I did! Turns out Wendy liked it enough to take it home and off my hands! I did get some pictures first though.